"Research-enhanced investment banking" means we join together the industry specialization and transaction experience of our investment bankers with the research and analytic capabilities of leading strategic intelligence consultants to address clients' strategic opportunities and challenges. Our strategic intelligence partners specialize in employing "primary source" research methods to generate market and company-specific information and analyses that traditional investment banks simply can't provide. Primary source research refers to intelligence gathering based on focused, confidential interviews with acquisition targets, competitors, suppliers, customers and other key market participants to generate information unavailable from public sources and unfiltered by secondary sources such as multiclient industry "studies." Providence Advisors' selected strategic intelligence partners have an extensive track record of assignments successfully completed for private equity groups and corporate clients. Working in teams with these intelligence specialists, Providence Advisors' investment bankers access their own industry/market contacts, and apply financial skills and transactional experience to draw well-informed, actionable conclusions from the intelligence gathered. Leveraging these proprietary insights and superior information gives Providence's clients a distinct advantage as we pursue, value, and structure a transaction. The result: our research-enhanced approach delivers real-time, highly accurate market-based information that allows Providence to help clients most effectively identify, evaluate and close value-creating transactions. 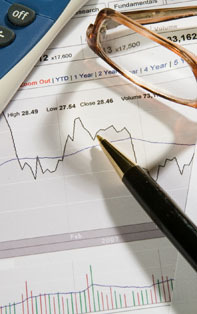 Insight –The industry expertise we possess combined with the market and company-specific information gathered by our strategic intelligence specialists provides clients with superior insight about potential acquisition targets, potential buyers and investors, industry trends, competitive conditions, and the merits, and risks, of specific transaction opportunities. 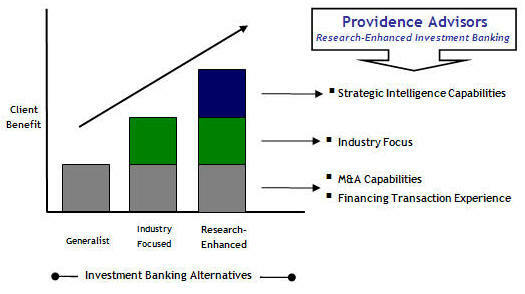 Effectiveness – Providence Advisors' integrated service offerings allow our clients to minimize the amount of time and money spent pursuing and evaluating unqualified or strategically inappropriate acquisition targets, avoid perpetually submitting to competitive auction processes, or avoid undertaking an ill-advised or poorly structured sale process. Simply put, we help clients do the right transaction, with the right terms and structure, at the right time, incorporating the value of all identifiable strategic opportunities and challenges. Informed Decision Making – Our combined investment banking and strategic intelligence resources uncover and analyze the information that allows clients to mitigate many of the uncertainties surrounding an acquisition, sale, or financing. Our unique capabilities facilitate intelligence-driven strategic initiatives and tactical decision making. The superior information we deliver gives our clients a value-creating advantage in structuring and negotiating the terms of a transaction.